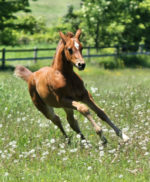 I love this confident, radiant filly! Much like her full sibling of 2014 “Sonnentanz”, this charmer is energetic, athletic, and full of sunshine. 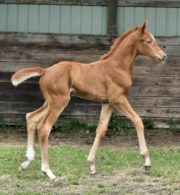 Purchased in-utero by Ryan Pedigo, she will be travelling to California post-weaning, with her buddy “Foreign Affairs”. 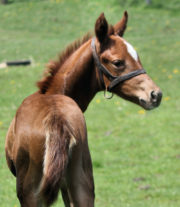 Starlet is shown below, at 3 days old, at pasture with her dam Espinette.